Hello friends! I hope you had a lovely weekend. 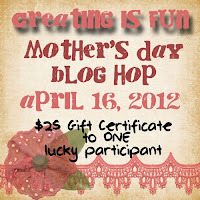 To start your week off right, Creating is Fun is having a Mother's Day blog hop complete with a PRIZE! One lucky person who does the hop and leaves comments will win a $25 gift certificate to the Creating is Fun Shop. Not only that but Creating is Fun is currently having a HUGE SALE! 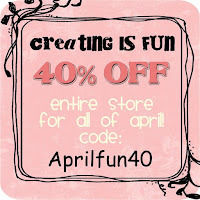 You can get 40% off everything in the store by entering coupon code: Aprilfun40. To start the hop head over to Martha's Blog, she's the owner of the store. Be sure to leave comments on every stop to be entered to win! Not only that, I hear there are a couple hidden blog candies on the hop too! Here's my card for this hop. I used a doily, peach lace, and cream/natural lace from Creating is Fun. 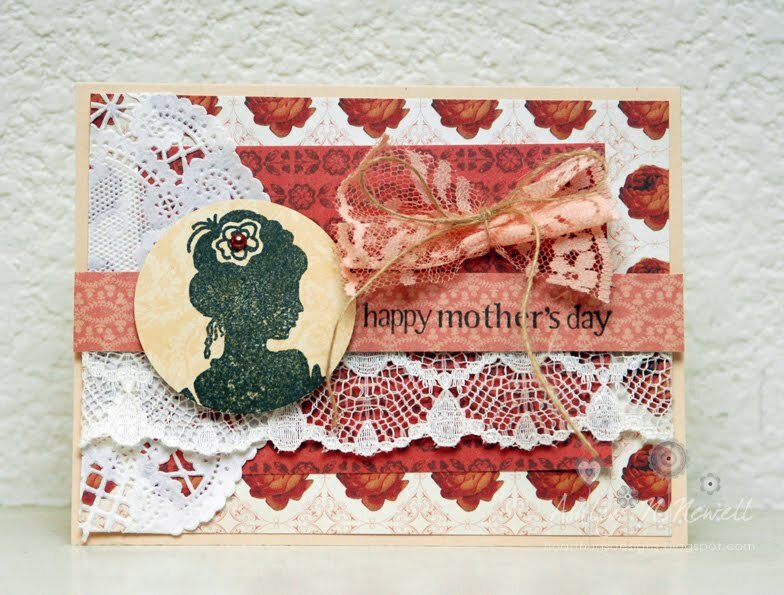 The paper is from Cosmo Cricket Evangeline, the image is Sweet Stamp Shop, and the sentiment is from Unity Stamp Co. I just finished with a little pearl. I'm also entering this into the Simon Says Stamp and Show Anything Goes challenge. Next up on the blog hop is Rebekah! Be sure to leave a comment here for a chance to win and check out the awesome sale! I love the lace and doily! Very pretty card! gorgeous Ashley.. I love this card! wow i so love this card. beautiful. i love the lace. super beautiful angie. i love the colors. really beautiful job. This is so pretty! Love the combination of the doily with the lace and the cameo. Great work! I love it! The cameo image and lace go so pretty together. Wonderful card! I love the image & lace and the colors are great as well! Pretty card, Ashley. Love the colors you chose. Love your card...great colours...love it!! Oooh, I love your card! All the fun vintage trims are awesome!